The latest energy market commentary. Cushman & Wakefield, in partnership with Premiere Energy Auctions, has released their Monthly Market Energy Update for January 2018. 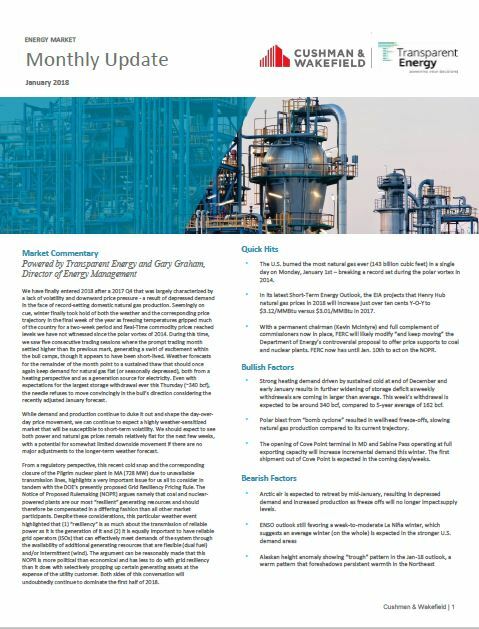 Read on to learn about all of the economic, geopolitical, and meteorological factors affecting the energy market. Expect a highly weather-sensitized market. 2017 Q4 was largely characterized by a lack of market volatility and downward price pressure. This was a result of depressed demand in the face of record-setting domestic natural gas production. January 2018 disrupted this situation, however, as freezing temperatures gripped large areas of the country for a two week period. During this time, Real-Time commodity prices reached levels not witnessed since the polar vortex of 2014, and we saw five consecutive trading sessions where the prompt trading month settled higher than its previous mark. However, the excitement within the bull camps seems to have been short-lived. Weather forecasts for the remainder of the month point to a sustained thaw that should once again keep demand for natural gas flat (or seasonally depressed), both from a heating perspective and as a source for electricity. Some things to consider moving forward: the EIA projects that Henry Hub natural gas prices in 2018 will increase just over ten cents year-over-year to $3.12/MMBtu versus $3.01/MMBtu in 2017. Additionally, the “bomb cyclone” resulted in wellhead freeze-offs that slowed natural gas production compared to its current trajectory. However, these slowdowns are expected to dissipate by mid-January—when the arctic air is expected to retreat.